After spending hours last night updating and re-writing their printing routines, Nick from Custom Stuff emailed over some print previews of playing cards with coloured boxes in each corner, according to our latest ideas. In short, some of them looked horrible. With the correct photo, with the correct border, on the correct coloured background, sometimes it doesn’t look ghastly (Queen of spades in the example photo) but mostly, the garish coloured blocks just distract from the images on the card and look awful (9 of spades). 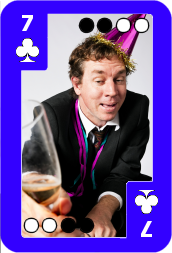 Yes, we could make playing cards with “regular” card faces, pips and spades and diamonds and the like. But even then, each suit would have three picture cards with a jack, queen and king on them. So they’ll still look terrible! This morning, Nick showed us some left-over offcuts from a deck made overnight. 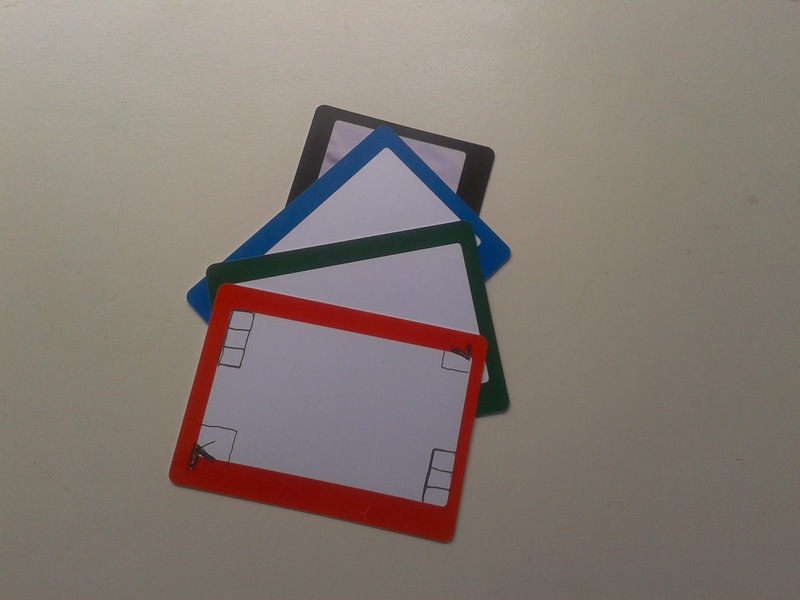 The customer had asked for a different coloured border around each of the cards, to signify which suit the card was (they were for teaching games to adults with learning difficulties). Apparently, thanks to the rise in internet poker and in particular, tiny graphics in mobile poker games, it’s not uncommon for poker cards to use different colours for different suits – black = spades, red = hearts, blue = diamonds, green = clubs. This makes identifying your cards easier on a small-screen device (apparently). My guess is that the programmers chose “primary” colours (let’s not get into yellow being a primary colour and green a mixture of blue and yellow – we’re dealing with lights, not pigments here!) to make each suit easily distinguishable from the others. Whatever the reasoning, this is quite fortuitous for us! The entire border of the card could be coloured to match the suit on the card (this was a quick mock-up, my guess is that clubs would probably be green, not blue). The numerical value of the card could be shown via a series of 4 black and white dots. Nick explained that these dots are much less conspicuous than large multi-coloured blocks, and we have to agree! Of course, a 4-bit value gives us a range of values 0-15 (or 1-16 if you prefer). Which is perfect: we can determine the suit of the card by detecting the colour of border, then read off the black/white dots to get the value. It does mean that we’ll need 5 LDRs instead of four (the fifth will be under the border of the card, immediately to the outer edge of the dots) but the symmetrical layout of a playing card means we can just put all five in a line and the orientation of the card will make no difference. We’re quite excited by this new development. The cards look great (we’ve yet to see a physical card, as Nick has a lot of work to do getting her programmer(s) to re-code their website for us!) and how it works should be quite simple. By using black and white dots, our LDRs should be able to read a white dot value, irrespective of the colour being reflected off the face of the card – we can use this as a double-check; if we flash a red light and read back two white dots, we would expect the same response when we flash it blue and green. Exciting stuff. We’re already building prototype boards (using black tubes over the LDRs like we did with our invisible instrument last year) for reading the black/white dots, and we’re pretty confident we’ll have this working quite quickly. The only bit we haven’t yet tried is the colour detection. More posts coming soon!